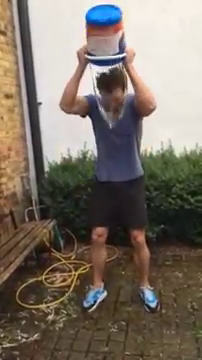 Jamie Dornan was challenged to take on the ice bucket challenge by Eddie Redmayne, while Eddie was doing it himself. Before Jamie completed his challenge, he called out long time friend, Andrew Garfield. We can't wait to see if Andrew accepts. Jamie Dornan tweeted the following video of himself and Eddie getting soaked in the name of charity today. Eddie Redmayne & I do the #IceBucketChallenge for @mndassoc - http://t.co/7ApG3D912Z Visit http://t.co/hPkdvBAd7X . In the face! We added 70 screencaps of Jamie and Eddie taking on the water challenge because we knew the Fifty Shades fans would want to see our Christian Grey getting soaked, frame by frame.